"Panic room" redirects here. For the 2002 film, see Panic Room. For the band, see Panic Room (band). A safe room or panic room is a fortified room that is installed in a private residence or business to provide a safe shelter, or hiding place, for the inhabitants in the event of a break in, home invasion, tornado, terror attack, or other threat. Safe rooms usually contain communications equipment, so that law enforcement authorities can be contacted. 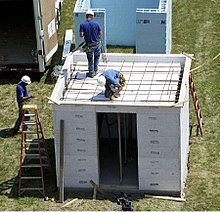 FEMA Mitigation provides information on building safe rooms inside homes for areas of the country prone to high winds. A mockup of a safe room is shown in the foreground. The most basic safe room is simply a closet with the hollow-core door replaced with an exterior-grade solid-core door that has a deadbolt and longer hinge screws and strike-plate screws to resist battering. Sometimes, the ceiling is reinforced, or gated, to prevent easy access from the attic or from an overhead crawl space. More expensive safe rooms have walls and a door reinforced with sheets of steel, Kevlar, or bullet-resistant fiberglass. The hinges and strike plate are often reinforced with long screws. Some safe rooms may also have externally vented ventilation systems and a separate telephone connection. They might also connect to an escape shaft. Safe rooms in the basement or on a concrete slab can be built with concrete walls, a building technique that is normally not possible on the upper floors of wood-framed structures unless there is substantial structural reinforcement to the building. The U.S. State Department often uses steel grillwork much like a jail to seal off parts of a home used by U.S. Foreign Service members overseas when they are living in cities with a high crime threat. In some cities, the entire upstairs area is grilled off, as well as every window and door to the home. Other homes have steel doors to one or more bedrooms that can be bolted closed to provide time for security forces to arrive. The safe room should be adequately anchored to the foundation to resist overturning and uplift. The walls, ceiling, and door of the shelter should withstand wind pressure and resist penetration by wind-borne objects or falling debris. The connections between all parts of the safe room should be strong enough to resist separation by wind. Sections of either interior or exterior residence walls which are used as walls of the safe room, should be separated from the structure of the residence so that damage to the residence will not cause damage to the safe room. Safe rooms may contain communications equipment, such as a cellular telephone, land-line telephone or an amateur radio transceiver, so that law enforcement authorities can be contacted. There may also be a monitor for external security cameras and an alarm system. In basic safe rooms, a peephole in the door may be used for a similar purpose. Safe rooms are typically stocked with basic emergency and survival items such as a flashlight, blankets, a first-aid kit, water, packaged food, self-defense tools, a gas mask, and a simple portable toilet. High-end safe rooms may have a gun closet, a biodefense air-filtration system that removes biological and nuclear contaminants, and a panic button that locks down the entire house. Safe rooms can be hidden behind many household features, such as mirrors, wardrobes, bookcases, sliding bookcases, and even fireplaces. Warships with CBRN protection generally have a central citadel, with a degree of armour protection as well as a filtered air system. Safe rooms on civilian ships, sometimes called "citadels", are increasingly being installed as a countermeasure against piracy. When attacked, the crew can retreat into the safe room and call for help (which in the case of ships of some countries may include the intervention of military forces). Because of the nature of ship construction, the safe room is typically constructed in a concealed location within a void within the ship, to resist efforts by the pirates to find the crew before help arrives. Safe rooms sometimes have facilities to allow the crew to remotely disable the ship's engines and electronic systems, making it impossible for the pirates to sail the ship to a location they control. The safe room is also typically armoured against direct physical attack, to allow the crew to remain safe for a few hours, even if located by the pirates, and to allow rescuing forces full scope for the use of armed force to re-take the ship without risk to the crew. The effect of the safe room is thus to deny the pirates access to the crew for hostage-taking, to remove the capability to move the ship to a location favourable for the pirates, and to facilitate retaking the ship by armed force without risk to the crew. The retreat of the crew to a safe room could encourage the pirates to leave the ship of their own volition. Safe rooms have been used as a defensive measure in ships threatened by piracy in Somalia. In 2010, 4,185 seafarers had been attacked and 1,090 taken hostage, but 342 were kept safe in a citadel. ^ "thedipnotes.com". thedipnotes.com. Retrieved 2014-03-07. ^ a b "FEMA: Preparing a Safe Room", U.S. Federal Emergency Management Agency, August 2010, web: FEMA-sr.
^ Talati, Sonia (December 10, 2016). "For Stylish Security, Get a Safe Room". Barron's. ^ "Hunch Mag". Hunch Mag. 2012-06-20. Retrieved 2014-03-07. ^ "South Korean troops board pirated ship". Herald Sun. April 21, 2011. Retrieved April 21, 2011. ^ Ocean Beyond Piracy (June 2, 2011). "Human Cost of Somali Piracy" (PDF). Archived from the original (PDF) on September 26, 2011. Retrieved July 7, 2011.